Collaboration is key to business success. How well your team collaborates directly impacts your efficiency, your productivity, and ultimately, your profitability. This makes optimizing your collaboration one of the most effective ways to improve your company’s performance. You can improve your collaboration both by implementing more effective collaboration strategies and by adopting better technological tools. Here are some tips on best practices for better collaboration, and on collaboration tools that can help you maximize your team’s productivity. A chain of command is a basic organizational principle that lays a foundation for effective collaboration. A concept borrowed from military use for business deployment, a chain of command defines the decision-making authority and flow of communication within your organization for transmitting instructions and questions. It defines who has authority for making decisions and assigning tasks, who reports to whom, and where workers should go first when they have questions or concerns. This speeds up collaboration by letting team members know exactly where instructions and questions should be directed. It also helps resolve problems more quickly by establishing who has oversight. To set up your chain of command, start by drawing up an organizational chart, showing who is in charge of which department and who works under them. Use this as a guideline to establish who should report to whom, in general as well as for particular projects. Communicate clearly to each supervisor and worker how the chain of command is set up. This lets supervisors know who they are responsible for, while letting workers know who they should receive instructions from, whom they should ask questions, and where they should go if they need to speak to someone other than their immediate supervisor. To apply your chain of command for enhanced communications efficiency, a best practice is to set up standard operating procedures for your communications processes. Having standard communications procedures helps your team members to know exactly who to speak to and what to do in a particular situation, saving time and avoiding mistakes, duplication of communications, and delays. Your standard communications procedures should include instructions on who supervisors should communicate with and who workers should report to, per your chain of command. It should also include the format for your communications and other relevant instructions. For instance, you might have a rule that all emails should have a subject line with a phrase or numeric code designating the topic under discussion, facilitating easy filing and retrieval. To maximize the advantage of having standard communications procedures, set up templates for your most frequent types of communications, which will save your team time when composing documents or planning meetings. Your communications procedures and templates should be documented for easy use and training. In order to implement your communications procedures efficiently, you need to select appropriate communications tools. Traditionally, companies have relied on internal phone systems and email for communication and collaboration. While these tools do retain value, they have been superseded by cloud-based versions of themselves, and by other tools geared toward mobile devices and one-to-many communications. One of today’s most important new sets of communications tools is team chat services such as Slack, Microsoft Teams, Google Hangouts, and Facebook Workplace. Modeled on social media platforms, these tools allow all team members in a discussion to see the same messages and access the same file versions, in contrast to emails where partners may need to catch up on a conversation or the latest file update. Team chat tools also often integrate with other important communication tools such as VoIP phone services, web conferencing services, and video chat services. VoIP can be a less expensive, cloud-based alternative for companies that rely heavily on internal phone calls. Web conferencing services can be essential for projects that involve collaboration in a digital workspace or collaboration between remote workers who need to share screens. Video chat can be particularly important if you have remote team members who need to be part of the conversation. Ideally, your communications solutions should integrate with a project management platform to facilitate efficient collaboration. A project management platform provides an interface for creating tasks, delegating responsibility, scheduling deadlines, sharing files, supervising projects, and tracking time. Using a project management platform lets you automate the process of supervision, saving time, boosting productivity, and improving efficiency. Some project management tools come bundled with full communications suites. Others are standalone tools with their own limited native communications features. Most can be integrated with external communications tools. Today’s most popular project management tools include Microsoft Project, Wrike, Altassian JIRA, Basecamp, and Podio. Project management tools can be combined with task automation tools such as Microsoft Flow, Zapier, and IFTTT to create customized automated workflows for increased efficiency when performing frequent tasks. For instance, you can set up a customized command to have an email reminder sent out to project team members as the due date of a project approaches. A project management platform works most efficiently when combined with standard project management procedures. Standardizing your project management procedures lets team members know exactly what steps to take when performing frequent tasks, saving time, and reducing the amount of unnecessary questions supervisors need to answer. You can create standard operating procedures for projects in any area of your business, including bookkeeping, internal document production, marketing content creation, sales, customer service, and IT. A good place to start is by reviewing which tasks your staff performs most frequently and standardizing these. Create step-by-step instructions for each task, document your instructions, place the instructions in a digital or physical location accessible to team members, and incorporate your SOP document into your training procedures. A good way to train new employees in standard procedures is to have them review your SOP document during their initial training period and suggest updates based on any changes they observe in your current procedures that have been implemented since the last update. To optimize your project management, you need to use big data analytics to track your performance. 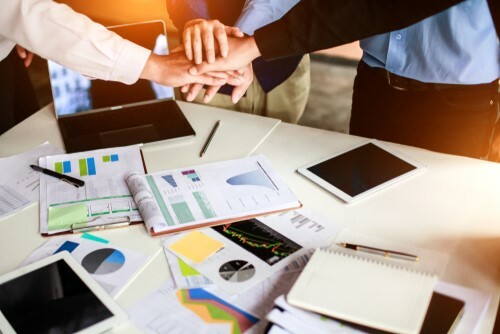 Employing analytics lets you see how well your team collaboration efforts are faring, where you may be falling short of goals, and where you need to make improvements to attain your business objectives. In order to use analytics to track project management, you need to define project management key performance indicators (KPIs) that can be measured. KPIs can measure productivity-related variables, such as how much of a workload your team can handle at one time and how well you’re completing projects on schedule. They can also measure financial variables, such as what return on investment projects are yielding, and how well projects are staying on budget. Some important project management KPIs include average time for a given type of project, individual and team time spent on a particular project, and on-time completion percentage. To put your KPIs to practical use, results should be viewable by supervisors and team members in an easy-to-read dashboard format, which can be set up by integrating your workflow tracking with business intelligence tools such as Microsoft Power BI and Zoho Reports. Optimal performance depends on human management factors as well as strategy and technology. Keeping your team engaged on projects is essential for maintaining worker motivation. Motivation is especially important for remote workers, who tend to be less engaged than on-site workers due to the lack of physical presence. One way to give all workers a greater sense of presence to one another is to use tools such as web conferencing and video chat to host periodic meetings. During meetings, you can discuss how team members have contributed to the success of the company since the last meeting, giving them a sense of participation and appreciation. Another method is encouraging team members to socialize on your company’s intranet or on social media platforms. For instance, you can create social media accounts for each team member and encourage them to create discussion groups based on popular topics such as sports, food, or movies. Periodically inviting team members to social events such as paid luncheons, company picnics, and sports events can also help promote a sense of camaraderie. Financial incentives, small gifts, and company memorabilia such as jackets and mugs are other ways to make workers feel more connected. Clearly defining your chain of command lays a foundation for efficient communication and effective collaboration. Establishing communications standards helps ensure that vital information is routed to the right team members in a way that is easily accessible and actionable. Cutting-edge technology tools such as team chat, VoIP, and video conferencing can help you optimize your communications. Communications tools can integrate with project management platforms for maximum workflow efficiency. Following standard project management procedures will help keep progress on track and on time. Employing analytics will help you make the adjustments you need for optimal team performance. Proactively promoting team engagement will motivate productivity.